Allen Brown’s New Book “Doomed to Circle 9” is A Thought-Provoking Narrative that Explores the Evils Now Found Throughout Modern Society. 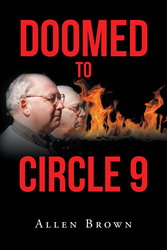 Recent release “Doomed to Circle 9” from Page Publishing author Allen Brown is a spine-chilling work of fiction about two vigilante brothers conspiring to eliminate those in modern society whose executive level crimes affect many innocents. Allen Brown, is a versatile author who has published 4 other books in genres for young and old. His new book “Doomed to Circle 9” is a gripping tale of conspiracy as two brothers at opposite ends of the country use stenography correspondence in planning and carrying out elimination of the most evil in businesses, in religious sects, and in government. Readers who wish to experience this epic work can purchase“Doomed to Circle 9” at bookstores everywhere, or online at the Apple iTunes store, Amazon, Google Play, Kobo, or Barnes and Noble.